Looking for pressure washing in CT? At Blue Mobile Power Wash, we provide all power washing services in CT! Many people think that just taking a pressure washer to their exterior elements will get the job done. Without proper training, however, you may not know exactly how much pressure to use or whether any pressure could cause damage. That is why at Blue Mobile Wash we use a combination of controlled water pressure and softwashing solutions to provide the perfect deep clean for a house. We specifically mix our softwashing solution for every job so it gets to the root of the problem right away. Then we use the proper amount of pressurized water to safely get the deepest clean. For roof shingles, for example, we don’t use pressure because that causes damage. For brick we need a bit of pressure, but not enough to chip it. For concrete the most effective clean comes from a great deal of pressure combined with strong cleaners that can get deep into the concrete pores. When Blue Mobile Wash gets done with your house, it will look brand new again. You’ll be amazed at how bright and sparkling everything is. All of the things you thought you’d need to replace will suddenly look vibrant and alive again. 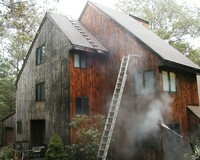 So if your home’s exterior is unclean and starting to fade, call us for pressure washing in CT! I need Residential Pressure Washing... can I get a free estimate?